Carson Wentz was sacked five times in the Eagles’ 20-16 win over the Colts Sunday. The dive at the sideline for a first down on third-and-6 didn't really present a huge risk Sunday to Carson Wentz, in his first game back from knee surgery, but the five times Wentz was sacked sure might have. 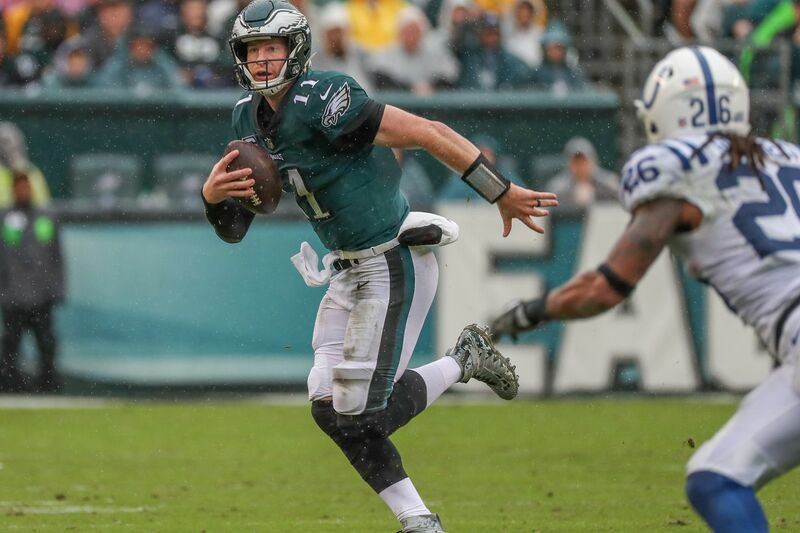 It's a safe bet that when Doug Pederson, Mike Groh, and company set up their game plan for Wentz's return, against the Indianapolis Colts, with a heavy dose of the run game and very few slow-developing shots downfield, they weren't envisioning five sacks. As Pederson noted in his Monday news conference, there were three factors, as there often are with high sack totals. "One is the offensive line gets beat, sack. It happens," Pederson said. "Second one is, quarterback hangs on to the ball or tries to scramble, gets sacked. The third one is flat-out coverage. They got you wired and you're trying to extend the play. "So a little bit of all three of those [Sunday] with the five sacks. Couple situations, maybe just throw the ball away and skip it and not put yourself in that situation. But they're all teachable and correctable and we'll learn from them." Wentz, who hadn't played since Dec. 10, certainly seemed to be holding the ball longer than was optimal, and was not quite as crisp in his decision-making as he will be once he gets used to playing again. But the Colts have a big, strong defensive front, with athletic linebackers who can shoot gaps. Particularly in the second half, they won more battles against the Eagles' vaunted offensive line than is usually the case. Margus Hunt caused a turnover by driving right at Lane Johnson, pushing the Eagles' athletic but lean (6-foot-6, 317) right tackle back to where Hunt could reach around him and slap the ball out of Wentz's hand as he cocked to pass. The Colts seemed to do a lot of blitzing, stunting and looping. The blitzing was effective for a couple of reasons – the Eagles were down to their three least-experienced running backs, who didn't always wait to make sure the coast was clear before heading into pass routes, and at times, Wentz was working in an empty backfield, with no one available to pick off an extra defender. Darius Leonard was able to sack Wentz during the Eagles' long drive for the winning touchdown because he waited for Wentz to play-fake a handoff to Wendell Smallwood, who was moving right, before crashing in from the unguarded left. Those stunts and loops got Hunt (6-8, 298) free a number of times, not always in a completely legal way. The Eagles stayed alive on that game-winning drive after it seemed Hunt had caused Wentz to hurry a throw that fell short of his receiver on fourth-and-5. But a flag flew for defensive holding, and on replay, it was easy to see Jabaal Sheard crashing Johnson into right guard Brandon Brooks, as Hunt disengaged from Brooks and went around Johnson to the outside. Sheard's hold – which Johnson emphasized by waving a hand in the air – kept Johnson from then getting out to Hunt. Pederson said he spoke to referee Clay Martin earlier in the game about defensive holding, and then got the call later. This would seem to indicate the Colts had gotten rushers free this way previously. "It's something that we kind of saw throughout the game and just wanted to bring it to their attention," Pederson said Monday. "Obviously, it was a true hold on Lane and [the officials] got it right." Johnson said Monday that it was "something that was going on for the majority of the game, but that's how it is sometimes." He added that he "kept fighting, kept battling to push through it. Paid off in the end." Left guard Stefen Wisniewski said after the game, "We definitely had too many [QB] hits [seven], and took many pressures and sacks. … A lot of slanting, a decent amount of blitz. For the most part, they did things that we expected. They obviously knew our offense really well, with Frank [Reich, the former Eagles offensive coordinator] being there"
Wentz hadn't been sacked that much since Week 2 in 2017, the six-sack loss in Kansas City when Pederson abandoned the run game early. *The Eagles played very little base defense against the Colts. Kamu Grugier-Hill, the third linebacker, played only nine defensive snaps, and one of those came when Malcolm Jenkins accidentally knocked the wind out of Nigel Bradham by planting his helmet in Bradham's ribs as they broke up an end-zone pass with a minute and 31 seconds remaining. Bradham returned as soon as he was able to breathe again. *Tight end Zach Ertz played 81 of 82 snaps. Wideout Nelson Agholor played 80 of 82. Yes, the Eagles really need to get Alshon Jeffery back in the receiving mix. Jordan Matthews, who played 33 snaps in his first game since Dec. 3 with Buffalo, caught both passes thrown his way and could help more as he settles in. *The Eagles' defensive-line rotation has really become a three-man rotation, with Fletcher Cox playing all but a handful of snaps (52 of 59 Sunday). Cox, gunning for defensive player of the year, welcomes the extra work, but it's also true that the Tim Jernigan the Eagles had playing the other defensive-tackle spot the first half of last season sure would be a nice addition to the current group. Jernigan is on the non-football injury list since having offseason back surgery, with no indication that he will soon be back on the field. The four DEs who rotate all played from 34 to 38 snaps against the Colts, with Michael Bennett getting some work inside, next to Cox, on obvious passing downs. *Kamar Aiken played 45 snaps, was not targeted for a pass. That you could trip up a quarterback at the 15 and sack him at the 20? Andrew Luck took almost as long to go down after Derek Barnett got to him, on fourth-and-3 from the Eagles' four, as the Eagles took to drive for the winning touchdown. Andrew Luck's 33-yard run was the longest against the Eagles this season. The Colts felt penalties beat them more than the Eagles did, on the 17-play, 11-minute, 18-second drive for Wendell Smallwood's winning touchdown. They ended the day with 11 accepted penalties, for 77 yards. But the home team racked up 10, for 110 yards, the second time the Eagles have surpassed the century mark in penalty yardage in just three games. Special teams are a particular concern. That five-yard penalty D.J. Alexander took for running into Indianapolis punter Rigoberto Sanchez late in the third quarter would have been a big deal if the Colts had been facing fourth-and-5 instead of fourth-and-about-5 2/3 at the time. The Eagles don't seem to be able to receive or cover a punt without doing something illegal. There were plenty of other offenders, though. Jason Peters played very well, a week after sustaining a quadriceps injury, but he took a pair of false-start penalties in the first half. Jalen Mills, of course, accounted for much of the Colts' aerial success with his two pass interference infractions; both times, he probably would have gotten away with contact had he not also decided to grab the receiver, just to make sure. Pederson defended Mills at the coach's day-after news conference. "Jalen has actually been playing extremely well. The flags yesterday, obviously he's got to get his off-hand — he's got a right or left hand that is going for the ball. The off-hand is in a position where he's hooking," Pederson said. "He's just got to be cognizant of that … and try and get it off. But he's always in position. Seems like he's right there to make the play. He's physical, he's tough, he can come up and make tackles. He's been solid, quite honestly, at the corner position."